Cargo Bikes. You’ve probably seen them zipping around town. Big cargo bin on the front (and, occasionally, on the back). Sometimes two wheels two wheels up front, sometimes not. Whatever they are, it’s clear that you can haul a lot of stuff with them. If we’re being honest, they can look a little ungainly. I mean, all that weight on the front? And how on earth can you manoeuvre it? Fear not, good friends! The cargo bike has been around for a long time. Until now, it’s been something of a niche product but with the world becoming more and more urban these fantastic cargo and people movers are poised to become a much larger part of the city landscape. But you’ve already got a bike! It does everything you need. And we agree. A cargo bike is fantastic but not for everyone. But here at Wike, we’re pretty sure that there are a lot of people that could use a box bike but it isn’t on their radar. So here are four reasons you’ll love a box bike. Let’s face it: this is the promise every bike manufacturer and green advocate has made about bicycles since the automobile displaced bicycles as a perfect mode of transportation at the turn of the century. But the reality is, a bike it primarily designed for transporting one person in a spectacularly efficient way. You can most definitely extend the usefulness of you bike with a bike trailer and other accessories but at its heart, the bike is one-person machine. And a one-person machine with no real room for passengers or cargo is not doing to replace a car. Don’t get us wrong. It absolutely CAN replace a car or at least one of your cars but there are times (sometimes many times) when you need the cargo and passenger room. No modern urbanite is going to deny this. Enter the cargo bike. Load it up with kids or (of course) cargo. Or both! Lock it up just like you would your regular bike and don’t worry about someone taking off with the box. Many cargo bikes are large enough to handle even furniture if that’s what you need to get to other side of town. With massive amount of cargo space, a cargo bike truly can replace your car. While you certainly can get a purpose-built cargo bike, most can double as something else. Kid carrier and cargo carrier are a common way of maximizing a cargo bike. And, in some cases, you can order specialized boxes for your needs at any given time. Kids grown up? Swap out the kid-specific hauler and swap in the cargo box. I know that most people are a little nervous about riding a bike filled with cargo. But while it might seem unwieldy and difficult, cargo bikes operate in much the same manner as your regular bike. The weight is properly centred on the bike which makes it easy to manoeuvre. Now, we’re not saying it will be a cakewalk but, just like a regular bike, a little practice goes a long way. 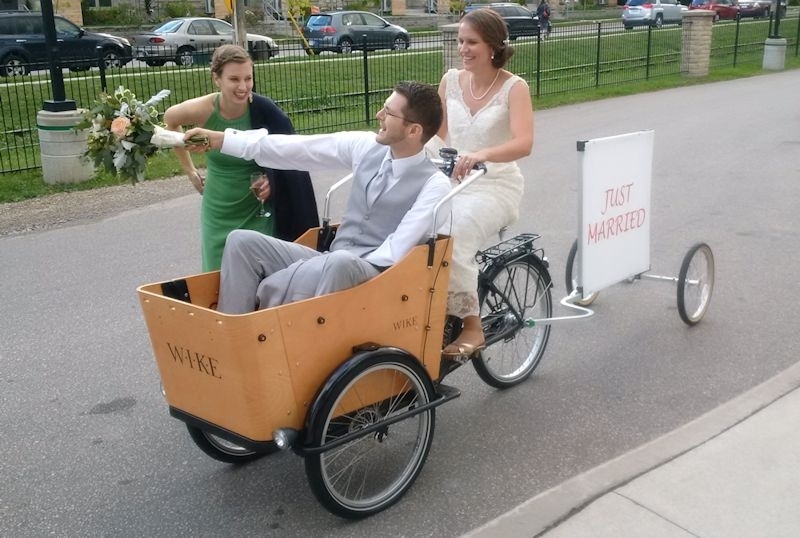 Depending on your cargo bike, you may need to get used to a longer wheelbase and how the bike handles. Take a few practice rides where you’ve got plenty of room and no cargo. Once you’re confident, load it up and practice some more! In no time you’ll be on your way. And keep in mind that it’s best to keep as much weight as close to the ground as possible. The more weight at the bottom, the easier your cargo bike will be to manoeuvre. As an avid cyclist, I can’t count the number of times I’ve been brushed up against by passing cars. Of course, this is more of North American phenomenon because I had no issues at all in the Netherlands with their separated bike lanes and other future thinking bike projects. But in North America, you’re pretty much fighting for space for at least part of your journey. But with a box bike, cars will most likely give you a wide berth. Whether they’re afraid they’ll scratch their paint job or believe you have less control, they want to give you space. So there you have it! Cargo bikes are more than just a novelty. Give them some consideration if you’re looking for a way to replace your car. Sometimes a regular bike just won’t do!